Are you looking to come face-to-face with decision-making REALTORS® across North Carolina? 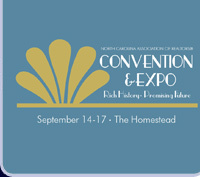 Plan on joining us for the NC REALTORS® Convention & Expo. The North Carolina Association of REALTORS® represents the buying power of over 31,000 members involved in all aspects of real estate. As one of the largest shows in the Southeast, this networking opportunity brings together close to 1,000 influential REALTORS® from around the state who are looking for the latest products and services to help them be successful. Our exhibitors help provide these solutions. Don't miss the opportunity to market your business in a "one-stop"event to the professionals who use your services the most. Act today: Exhibit space and sponsorships are confirmed on a first-come, first-served basis. -Paula Payne, President, Systems Engineering, Inc.